Click on this image to read the article from the Observer dated 8 November 2014 on the UK Physician-assisted Suicide Bill and watch the video link below about the House of Lords debate. 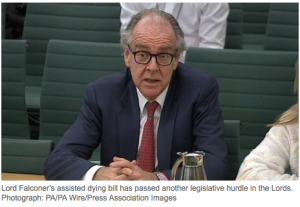 Lord Falconer proposes this end-of-life choice should be available within two years time for people who have six months or less to live. Do you agree? Disagree? Let us know your views.